While the rest of the country is breaking out the sweaters, boots, and pumpkin spice lattes, San Franciscans are busting out their sundresses and sandals. Strangely enough, September and October are our warmest months—it's something to do with the land and ocean temperatures evening out, which then keeps the fog away. After a particularly rough Fogust, I'm not complaining about it. At all. There will be enough time to wear cashmere and scarves and vests later in the year. 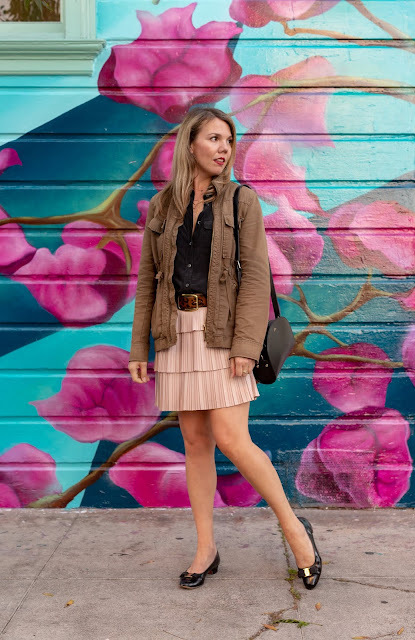 So here's how I'm dressing for Indian summer* in SF. 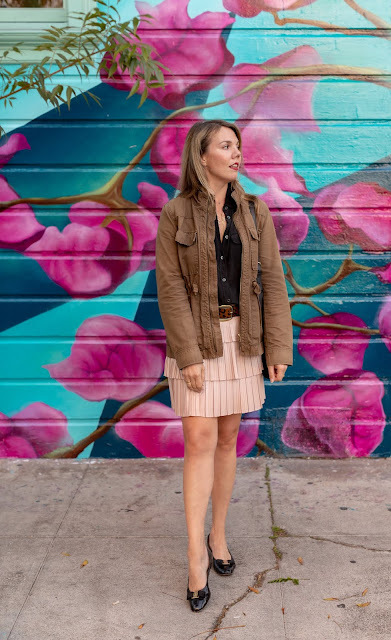 It's been several months since I last featured my favorite jacket, and if you clicked on that link, you may realize that I'm also wearing it with the same skirt I'm wearing in this post. Perhaps I could have been a little more original with this outfit, but while the previous one had more of a spring-summer vibe, I was going for more of a fall-transitional feel with this one. And it also goes to show how much I love this jacket (and the skirt, but more on that later). It's just the perfect weight for warmer weather, and it goes with pretty much everything. Like the jacket, I have also had this Equipment blouse forever. They still make it, and it's well worth the investment. I generally prefer knit tops to woven ones, thanks to my stealthily large chest, but this is one of the few blouses I've ever owned that doesn't gape at the chest—it is cut that perfectly. It's also warm in the winter, cool in the summer, and nice and thin, so it's easy to layer. The darker color also helps draw away attention from the aforementioned bust area. 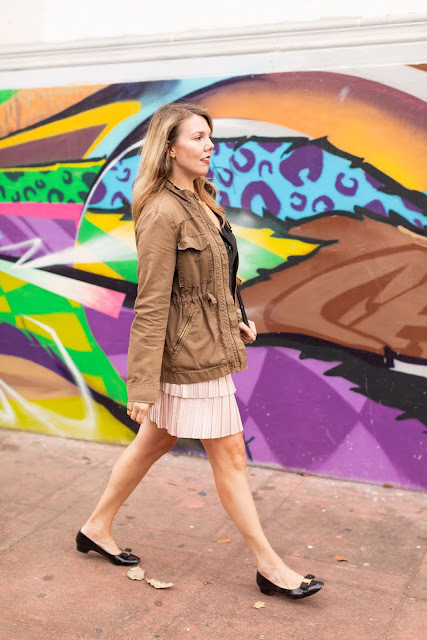 This BCBG skirt (also seen here) has been one of my favorite purchases so far this year. I love the pale pink color, and the tiered shape is flattering without being bulky. I also love skirts, especially with bare legs, and as long as the weather is cooperating, that's what I'm wearing. This skirt is now on major sale at Bloomingdale's, so now's the time to buy it (I'm in a medium). 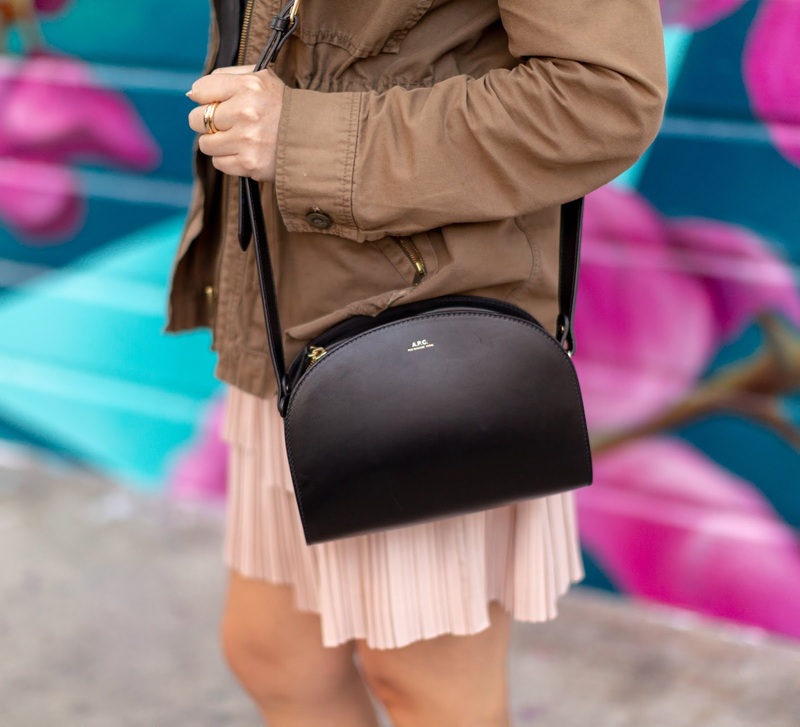 As I've mentioned before, this skirt has an ugly elastic waistband, but it's an opportunity to wear a cute belt and give your shape a little definition. The leopard-print haircalf belt I'm wearing here also helps give the look a little autumnal feel. It's a little unexpected against the pink skirt, but since I'm in the leopard-is-a-neutral camp, I think it works. This is the third week in a row that I've featured my A.P.C. bag (last seen here and also here), and I promise I'll have another one in my outfit post next week, but let me reiterate: I love this one. It is perfect. That is all. While it can be tempting to wear sandals this time of year—and I do, especially with pants—a closed-toe shoe feels a little more fall-forward. These Ferragamo flats (last seen here) are a bit of an investment, but they are hands down one of the most comfortable pairs of shoes I own, and I think they're worth it. They're classic like a ballet flat, but I find they offer way more support, and they come in a variety of widths, which is a rarity nowadays. 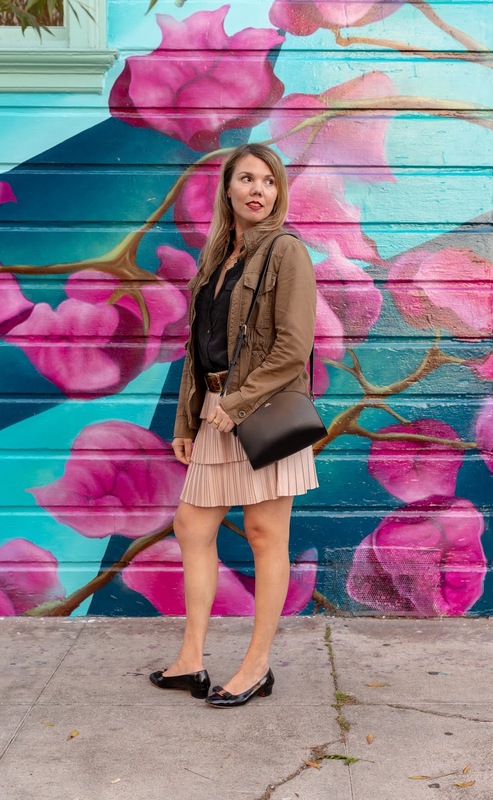 This was our first time shooting in the Mission, which is the super-hip neighborhood in San Francisco and one of our favorite places for date night. The Mission is also known for its street-art murals, and there were so many fun ones, we wondered why we hadn't shot here before! *While the origins of this term are hard to pin down, I mean no offense to Native Americans. I love your blush pleated skirt. It's so pretty and girly. You definitely made it fall appropriate with those flats and that jacket! I love this summery like skirt with the more fallish top and jacket!! Such a great way to transition to fall, Cheryl!! I love your chic layers! That pleated skirt is so pretty and feminine! Love this jacket! You look so stunning! Lovely outfit for a warm fall! I love the jacket pair with the skirt, beautiful combination. It is the same way in North Carolina. I guess by the end of the month, it will feel like fall! It is interesting to know SF is warmer in Sept and Oct. We are going to Napa and Sonoma, maybe SF for a few days. I love the pleated skirt, pretty color! I bought an Equipment blouse , thrifted and the quality is terrific. Love this outfit made more casual with your cute utility jacket. What a pretty skirt. Lovely photos Cheryl :) Thanks for linking up to The Wednesday Link Up.